In Chapter 11 we learned about the cell cycle and its control. Given the intricate interplay of regulatory elements involved in the cell cycle, it is not suprising that mutations that affect this regulatory system can lead to uncontrolled cell growth: cancer. There are two general catagories of genes affected by such mutations: protooncogenes and tumor suppressor genes. Before examining current attempts to counteract the effects of cancer-causing mutations to somatic DNA, we will briefly consider how mutations in cell cycle control genes can lead to malignant transformation that is the basis of many forms of cancer in humans (table 3). Genes that when introduced into a normal cell cause it to become a cancer cell are called oncogenes, from onco, the Greek word for tumor. Oncogenes were originally discovered by the process of transfection, in which DNA isolated from one cell is introduced into another cell. DNA isolated from tumor-derived cells led in transfection experiments to the transformation of normal cells into cancer cells. These same genes, in mutated form, were soon isolated from a variety of tumors. The normal, non-mutated forms of these genes came to be called proto-oncogenes, or genes that can be mutated to produce a tumor-forming oncogene. Subsequent study has shown that these genes all encode proteins that are necesary for the cell to interpret external signals for growth (figure 4). As discussed in Chapter 11, these signals are necessary for a cell to leave G0 and to pass the G1 checkpoint. Mutations in proto-oncogenes accelerating the cell cycle by amplifying these signals. The main classes of oncogenes. Before they are altered by mutation to their cancer-causing condition, oncogenes are called proto-oncogenes (that is, genes able to become oncogenes). Illustrated here are the principal classes of proto-oncogenes, with some typical representatives indicated. If a growth factor receptor is mutated such that it is always on regardless of binding to the growth factor, the gene encoding the receptor will act as an oncogene. Similarly, all of the genes encoding the proteins necessary to carry this signal from the surface of the cell to the nucleus can be mutated to greatly amplify the signal, effectively converting the signal pathway genes to oncogenes. As oncogenes produce their effect in the absence of the normal divide signal, they will be inherited as dominant alleles. That is, they will exert their cancer-causing effect even in cells heterozygous for the mutant oncogene. Chromosomal abnormalities can lead to the activation of proto-oncogenes. A rearrangement that moves a strong enhanver near a proto-oncogene can lead to either overexpression, or to expression in a tissue where the proto-oncogene normally is not expressed. This was first observed for the Philadelphia chromosome and Chronic Myelogenous Leukemia. The translocation of a portion of the chromosome creates a chimeric gene that includes the proto-oncogene c-ABL, causing c-ABL to be expressed and producing leukemia. Among the most widely studied oncogenes are myc and ras. Expression of myc stimulates the production of cyclins and cyclin-dependent protein kinases (Cdks), key elements in regulating the checkpoints of cell division. The ras gene product is involved in the cellular response to a variety of growth factors such as EGF, an intercellular signal that normally initiates cell proliferation. 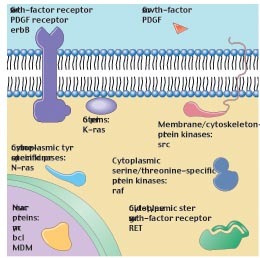 When EGF binds to a specific receptor protein on the plasma membrane of epithelial cells, the portion of the receptor that protrudes into the cytoplasm stimulates the ras protein to bind to GTP. The ras protein/GTP complex in turn recruits and activates a protein called Raf to the inner surface of the plasma membrane, which in turn activates cytoplasmic kinases and so triggers an intracellular signaling system. The final step is the activation of transcription factors that trigger cell proliferation. Cancer-causing mutations in ras greatly reduce the amount of EGF necessary to initiate cell proliferation.